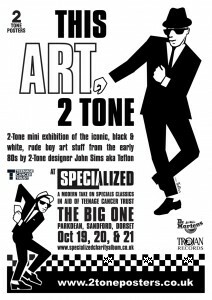 2 Tone Posters are please to be showing a mini THIS ART 2 TONE exhibition at the SPECIALIZED -THE BIG ONE event at Parkdean, Sandford, Dorset on October 19, 20 and 21. This sees the Specialized project come to a close and with a grand total of monies raised for Teenage Cancer Trust. 2 Tone Posters are pleased to be showing a mini THIS ART 2 TONE exhibition at the SPECIALIZED -THE BIG ONE event at Parkdean, Sandford, Dorset on October 19, 20 and 21. Teflon will also be giving a signed framed print of one of the classic 2 Tone designs as one of prizes at this event. Very pleased to have designed and produced the artwork for The Selecter “Live In Britain” album out now on 12 inch vinyl and CD digipak. The 12 inch also has a designed inner sleeve of pictures taken from the “Made In Britain” tour. It was also very good to use the brilliant photography of the Orginal John Coles. The association of both John and I with The Selecter goes right back to the early days on 2 Tone. 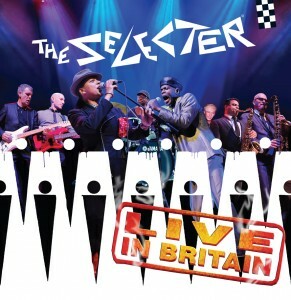 Catch The Selecter on the Live In Britain tour see: www.theselecter.net for tour dates. You are currently browsing the classic 2-tone graphics news archives for September, 2012.